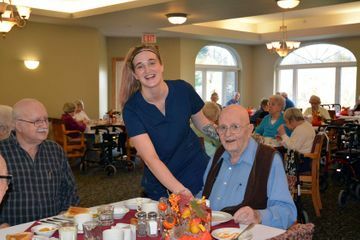 Book a Tour: Take a stroll through our wonderful facility with our staff at Kelso Villa Retirement Homes in Owen Sound. Enter a world of compassion, respect, and warmth today! At Kelso Villa Retirement Home, we pride ourselves upon offering exceptional retirement living in a warm, friendly and safe environment. We are eager to provide you with the qualified, respectful and attentive care you deserve each and every day. Keeping five to six nurses to care for our seniors at all times, we are attentive and prepared to meet your needs. Located in Owen Sound in the heart of beautiful Grey Bruce County, Kelso Villa offers a full range of services to meet your needs both today and in the future. Enjoy affordable retirement living in our state-of-the-art facility, which allows you to maintain your independence and enjoy the companionship of others. We strive to make sure that our residents are satisfied in a comfortable and warm environment. Creating a variety of fun and welcoming daily activities and programs, we’ve fostered a family atmosphere for all of our residents. 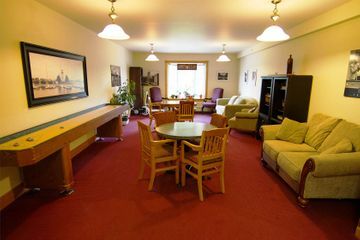 Overlooking the scenic Georgian Bay and the Owen Sound Harbour, our facility offers: 24-hour nursing supervision, linen and personal laundry services, nutritious meals served daily in our bright, spacious river-view dining room; and, fresh-baked goods and fresh fruit offered daily in our inviting coffee lounge. To learn more about our accommodations, walk through our website or contact us today for a personal tour of our homes. We would welcome the opportunity to show you how wonderful retirement living can be at Kelso Villa! Learn more about the professionals that care for our seniors. We feature a library, a game room, a chapel and so much more.